Tails!. . 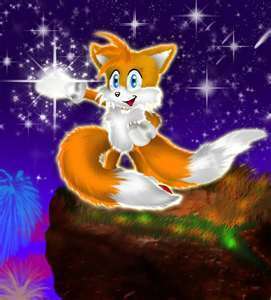 Wallpaper and background images in the Miles "Tails" Prower club tagged: tails cute. Is that a star in my hand? I think if you show that you really love her, just tell her that. But she has to love you too. YES!!! Thanks bro. Turns out she likes me too! Cream : Just make sure you keep your promises! Cream : Could you help me find my dolly though? AHHHHHH! Tails is so darling! isn't he?